Your team’s best defense isn’t on the field. It’s on the sideline. 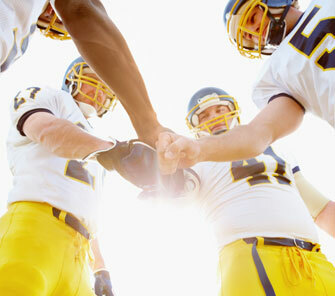 As medical professionals, athletic trainers can make a critical difference at the moment an injury happens. They’re also essential during treatment and recovery, but perhaps most importantly, research shows athletic trainers actually may help athletes avoid injury in the first place. As part of its commitment to improve athlete health and safety at all levels of sport, the NFL Foundation has launched a pilot grant program to increase the number of high school football players with access to an athletic trainer. Current research suggests nearly 30% of high schools do not have an athletic training program. In collaboration with Gatorade, the National Athletic Trainers’ Association, the Korey Stringer Institute and the Professional Football Athletic Trainers Society, this program aims to improve the health and safety of student athletes at up to 150 public high schools beginning next fall. Eligible schools in four states – Arizona, Illinois, Oklahoma and Oregon – can apply for a three-year grant award totaling $35,000 through this pilot program. In addition to administering the grant program, the Korey Stringer Institute will also lead research efforts on the impact of the program and the impact of athletic trainers on student athlete health outcomes. Eligible schools are encouraged to apply before the January 6, 2017 deadline. As a pilot program, any future plans for this grant will be determined following an assessment of this program. The NFL Foundation Athletic Trainer Grant Pilot Program builds on recent initiatives developed by the NFL Foundation to increase the number of young athletes with access to an athletic trainer. In 2014, the NFL Foundation established a matching grant program designed to help NFL teams increase access to athletic trainers in their communities. To date, twenty NFL clubs have utilized this grant to support local schools and leagues. Last year, the NFL Foundation – with the National Athletic Trainers’ Association and Gatorade – expanded this effort through a contest open to high schools nationwide. Fifteen high schools received funding to hire an athletic trainer. The NFL Foundation is proud to collaborate with the National Athletic Trainers’ Association (NATA), the Korey Stringer Institute (KSI), Gatorade and the Professional Football Athletic Trainers Society (PFATS) to promote sport safety for young athletes.